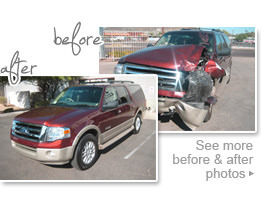 Andy’s Collision Centers are full service Automotive paint and Collision Shops with three convenient locations servicing Phoenix and the West Valley. Andy’s Collision Center has been in business since 1958 and under the same ownership for the last 41 years. Andy’s has repaired more than 95,000 vehicles over the last 60 years. We specialize in both foreign and domestic vehicles and have the facilities and the expertise to take on any paint or auto body repair job. Our professional, trained staff of estimators, technicians and office support personnel is ready to assist you. Our attention to detail helps to achieve customer satisfaction. We will provide a detailed, computerized written estimate of the repairs required to bring your vehicle to pre-accident condition. We will communicate with you throughout the repair process and will return your vehicle to you as promptly as possible. We will review all repairs with you and answer all questions. We offer a Lifetime Warranty on all collision repairs. Our commitment to our customers and our pride of owners has contributed to our success & growth for over 60 years in the valley. 9325 N. Cave Creek Rd.